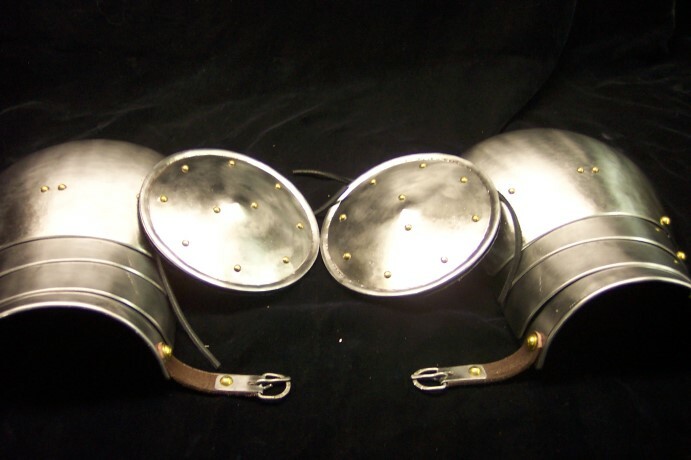 I have for sale, a pair of the regular spaulders we used to make, a pair of scalloped edge spaulders and a pair of steel trimmed spaulders. 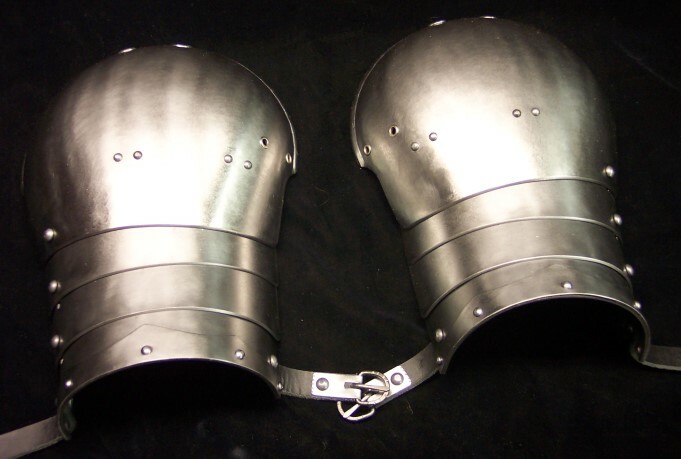 The regular set of spaulders are show with a set of besagues I made but are avaliable without them. They are made from 16 gauge CR steel with hand rolled and counter sunk edges where appropriate, as well as beveled edges where appropriate. The spaulders articulate on both leathers ( front and center ) and slot riveting ( back ) as per historical examples I used to own. 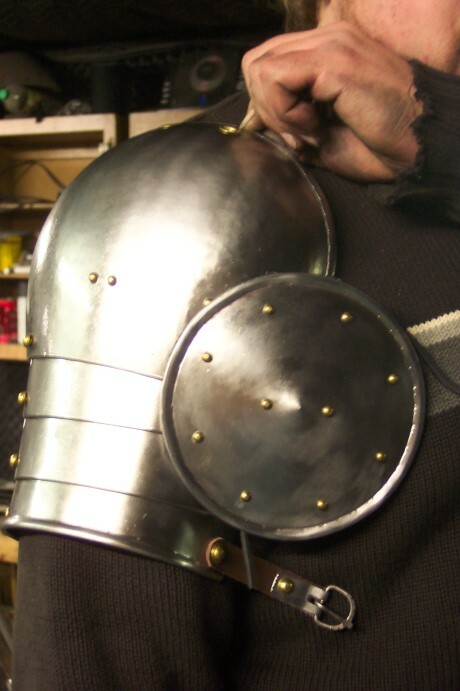 The spaulders have eyelets for pointing but I can install a set of buckles if desired for attachement to a gorget. Includes hand made buckles with steel strap ends with light file and chisel work decoration. Like to get $70 for the spaulders ( well under what we used to sell them for ) plus shipping and $20 for the besagues plus shipping. The scalloped edge spaulders are made from 16 gauge CR steel and have rolled and counter sunk edged on the top plate and bottom lame. The rest of the lames have a bit of a decorative scallpoped edge which is also beveled. The spaulders articulate on both leathers ( front and center ) and slot riveting ( back ) as per historical examples I used to own. 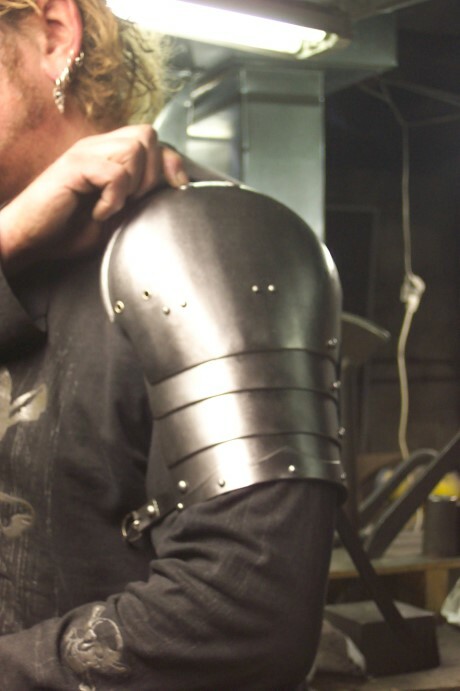 The spaulders have eyelets for pointing but I can install a set of buckles if desired for attachement to a gorget. Includes hand made buckles with steel strap ends with light file and chisel work decoration. Like to get $70 for the spaulders plus shipping. 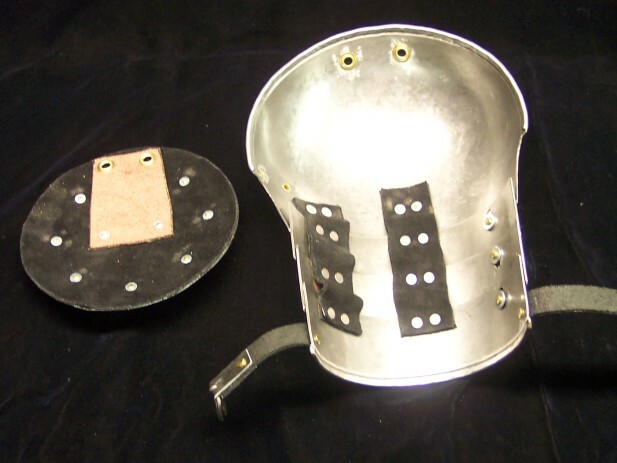 The spaulders with steel trim are made from 16 gauge CR steel, they have steel rivets, and scalloped steel trim on the edges of the lowest lames. Hand rolled and counter sunk borders and beveled edges where appropriate. Articulates on leathers, front and middle and slot rivets in back. 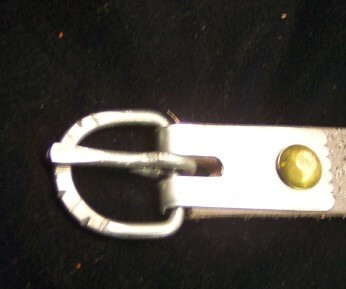 Includes hand made buckles in steel strap mounts. There are two eyelets at the tops for pointing but I will install buckles for attaching to a gorget free of charge if desired. I have 14.5 inch biscepts and took arm harness into account when building. I can alter curvature some for sizing if neccessary. Like to get $70 plus shipping for the pair. Feel free to ask questions. Paypal, check or MO are fine. Hi Al, I'll take the plain steel if you still have them. Let me know. Thanks! Allan... I'll buy the Scalloped spaulders in they're still available. I can pick them up too.